KEYLINE Architecture studio is a multidisciplinary professional group which main goal is making reality our customers’ interests, contributing in and phase or aspect, in a continued search process of an architectonical answer. Going beyond is a concern in each of our works. 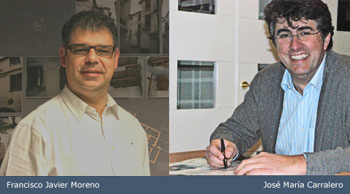 The human resources team is directed by their directors and founders, architects José María Carralero and Francisco Javier Moreno, and it has being growing proportionally to the activity we carry out. The installations centered in Málaga haven’t prevented the development of other projects in Seville, Granada, Cádiz therefore as well as in Madrid and Huelva. Our costumers’ concerns have made as expand our field of performance to site management and extend the relation between our team and customers. Our working method starts from studying the needs, adapting them to the location problems, in all its extension, solving the problems and administering the viability of the solutions to materialize a corect architectonic answer. The success of our work is in maintaining the idea in the whole process, getting to the detail solution: architecture is a set of details. Virtual reality’s new technologies, as well as BIM models philosophy (Building Information Modeling) allows us to cover the return-way until solving the detail in the EASIEST, MOST ECONOMICAL AND EFFICIENT way.